Waitangi Treaty Grounds with visiting school children playing on grass. Naval flagstaff standing where Te Tiriti o Waitangi (Treaty of Waitangi) was signed. 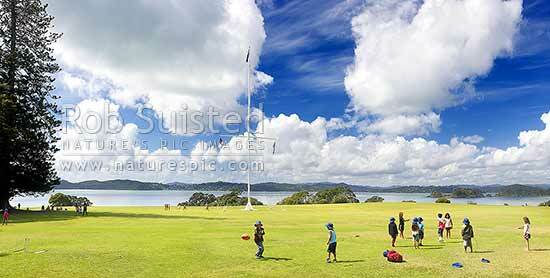 Panorama, Waitangi, Bay of Islands, Far North District, Northland Region, New Zealand (NZ), stock photo.